A 93-year-old World War II veteran is preparing for the release of his first poetry collection this Veterans Day. 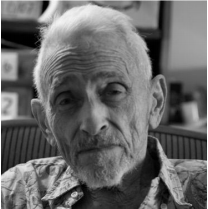 Herbert Engelhardt was just a teenager when he served in the Pacific Theater of World War II during 1943-1946, but it wasn’t until age 75 that he began writing poetry. His debut collection, “World War II Poetry: Memories of an Ordinary Soldier” contains nearly 100 pieces of his poetry – just a snippet of the 3,000 poems he’s written so far. Engelhardt says the poems capture the thoughts and feelings of an Army soldier aged 18-20 in the Second World War. One poem, “Survival,” is a minimalist piece that packs a punch in just six lines. It’s ending, “Tell yourself/It’s not your fault/When someone else’s luck runs out,” exposes a glimpse of a surviving soldier’s feelings after watching their fellow men lose their fight. Another titled “Replacement” details Engelhardt’s training as a radio operator using Morse Code, only for the Army to hand him a rifle and put him in a foxhole. “Quiet Beach” recounts the moments on the Okinawa beach before Engelhardt was called to the front lines. “We were handed M1 rifles/Trucked a couple of miles to the front/Worlds away from our quiet beach,” the poem described. Shortly after that glimpse into Engelhardt’s service, he joined the Battle of Okinawa and became injured, later receiving a Purple Heart. The book also contains 10-15 pages of prose that detail his time in the service in a less-nuanced manner. It concludes with a section titled “Afterthoughts,” in which he expresses his gratitude for his military service and the resulting experiences, friends and lifelong impacts. When asked why he decided to create a poetry collection, Engelhardt said he couldn’t find existing poetry collections with the kind of poetry he wanted to write. “Harvey Shapiro put together a book of World War II poetry about 20 years ago, and I thought that it was missing some of the stuff that I wanted to write about,” he explained. “That’s all. No fancy message,” he humbly insisted. “People don’t always know what it feels like to be a soldier, and I tried to give the reader the feeling of what it’s like to be a soldier – an enlisted man,” he said. He said fellow World War II veterans, as well as Korean War veterans, found the book interesting. After his time in the service, Engelhardt went on to earn a BA and MBA from Harvard, and spent three decades working in marketing, finance and management. He then spent 20 years as a professor at NYU Stern School of Business, retiring in 2003 at age 78. Creating 3,000 poems in his golden years hasn’t been an easy task – Engelhardt doesn’t use computers. He handwrites his poems and has a typist come in each weekend to type up his poems. But his process doesn’t stop there. He makes numerous revisions to each piece. “Some of these have been 30 or 40 drafts,” he said. Some of his poems have been published individually by literary publications such as Harvard Review Online, Locuspoint and Best American Poetry.